Our wonderful, ground-breaking global HQ for Mayborn Group, the company behind global baby brand Tommee Tippee, has now been launched! Lucky Mayborn staff are now in the process of moving in. “Unbelieveable!” is how many of them are describing their new home. 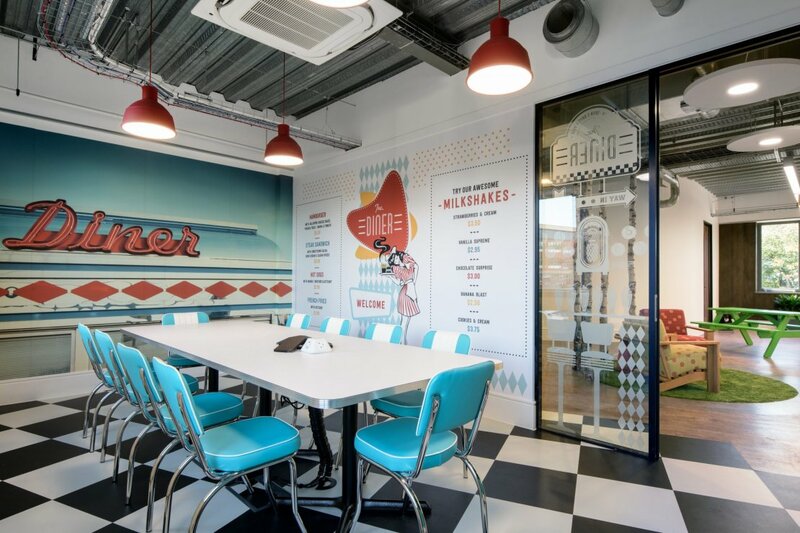 At Ben Johnson Interiors, we are also delighted to hear that these offices are already being described by the press as ‘one of the coolest places to work’ in the area! Located in Balliol Business Park, North Tyneside, this new 30,000 sq ft workplace has been created to reflect Mayborn Group’s vision to be the world’s most loved baby company. The completed workplace offers the 170-strong HQ team lots of choice, comfort and autonomy in the way they work. The whole concept of the interior design supports collaborative working and encourages creativity and expression. Mayborn Group has plans to grow locally to over 200 people and this new site will be the core from which the company grows its global footprint across Europe, North and South America, China and Asia to support its 1,200 strong workforce. 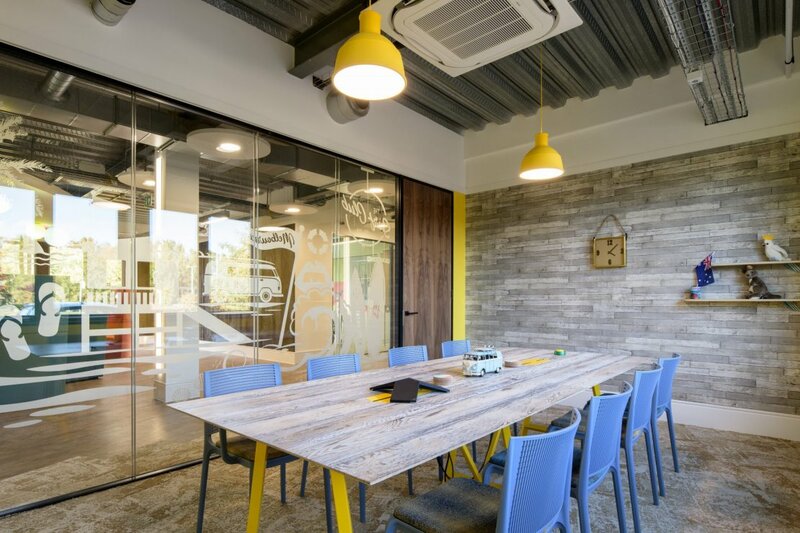 The client was very clear throughout the design process that they wished the wellbeing of their employees to be central to the working environment and Ben Johnson Interiors were happy to suggest the latest ideas, products and themes to support this. The brief for the reception area alone was that on entering the building, the atmosphere should put a “smile on your face” and we have managed to continue this theme throughout. You will find a fun “beach” and a “park” area, as well as numerous, themed meeting rooms based around toddler activities and the global locations where Mayborn operates. Although the first and second floors are more “business” orientated – they are still aligned to the relaxed ground floor and reception. Each of the four areas on the upper floors have striking corporate colours, playful typography, a great choice of comfortable, vibrant meeting areas and a variety of sound-proofed booths. 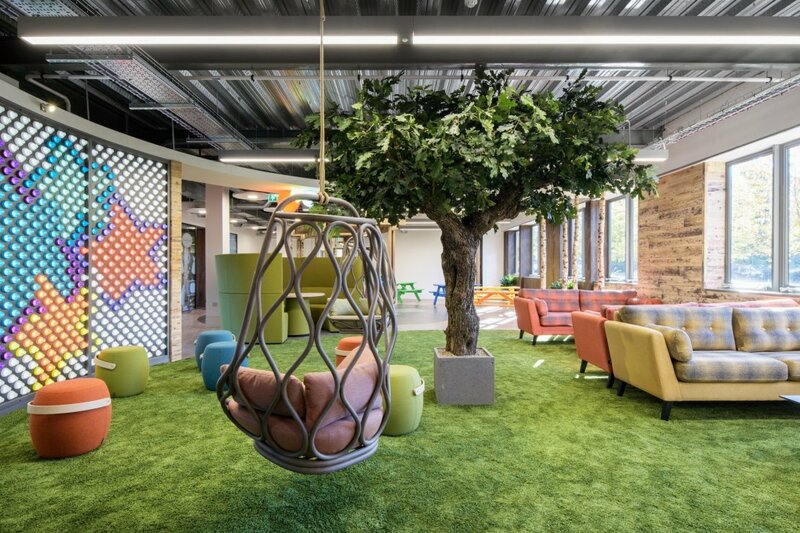 Lots of natural light, interior birch tree trunks, lovely views of plants and foliage outside – as well as a tree inside too – bring calming elements of nature into the office environment. 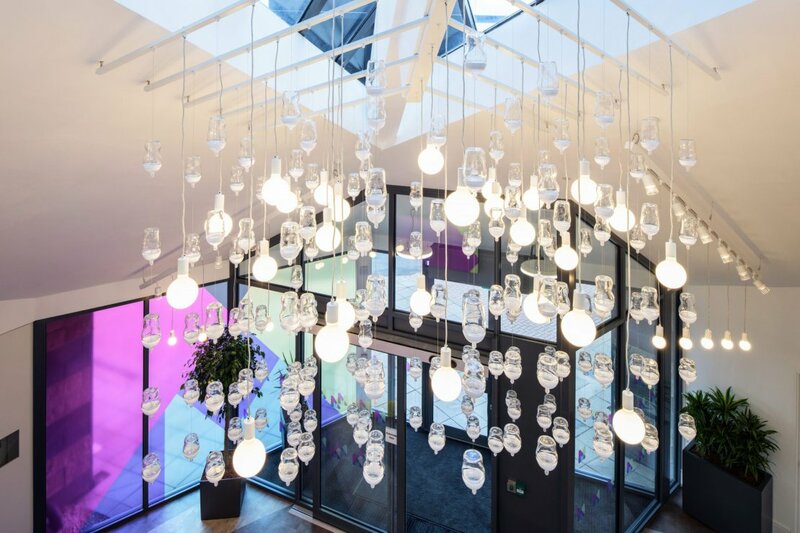 There are products visible in every part of the building including a lighting feature made of 800 Tommee Tippee style feeding bottles. This fully digital working environment has Research & Development labs on site and also state-of-the-art conferencing facilities to connect Mayborn Group HQ with its global markets and teams.